Hero Honda CBZ Xtreme is one of the most powerful bikes launched in 150cc category. The bike has an edge over other competitors in every field – looks, power and comfort. Hero Honda CBZ Xtreme has already captured a sizeable share in the Indian bike market and has a good future ahead. Hero Honda CBZ Xtreme is available in five beautiful colors – Vibrant Blue Metallic, Black, Boon Silver Metallic, Candy Blazing Red and Sports Red. The broad headlamp and fairing are very simple in appearance. The elongated turn indicators on either side of the fairing are eye catching. The body coloured rear view mirrors, large fuel tank with Xtreme’s logo, sleek tail lamp provide a sporty look to the bike. Hero Honda CBZ Xtreme has various comfort features. The self start bike has Analogue Fuel Gauge, Analogue Tacho Meter, Analogue – 1 Trip Meter, Analogue Speedometer and Passenger Footrest. Other comfort features include Step-up Seat, Pass-Light and Low fuel Indicator. Hero Honda CBZ Xtreme has laid special attention for safety aspect. The front suspension consists of Telescopic Hydraulic Shock Absorbers. Front Brakes consist of 240 mm dia disc Non asbestos type brake whereas the rear brake consists of 130mm Internal expanding shoe type brakes. 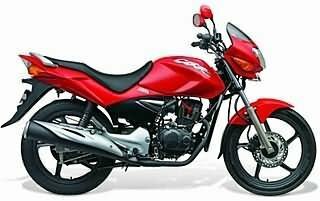 Hero Honda CBZ Xtreme consists of 149.2 cc, Air cooled, 4-stroke engine. It produces a maximum power of 14.3 bhp at 8500 rpm and a maximum torque of 13 Nm at 6500 rpm. The engine sports a 5 speed gearbox. The vertical format engine is assisted by Constant Velocity (CV) carburetor. The price of Hero Honda CBZ Xtreme is Rs.57548 (taking Mumbai as base price location). However, the price specified is indicative price only and reflects lowest approximate price which excludes tax, registration, insurance and cost of accessories.